Lamps, fans, even Christmas Trees are just a few of the things you can automate in your house with an iHome Smart Plug ($49.99 on Amazon). Plug in items across your home (we recommend one per room as a start), and control them with a simple app, or your voice through iOS or the Amazon Echo (read about the Echo here). 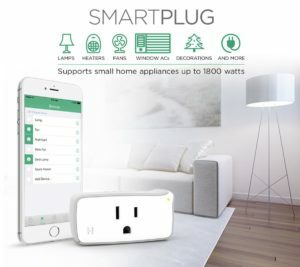 You can connect several iHome Smart Plus, as well as other items we have listed here on our site, to create “scenes.” Those scenes then can be triggered with words like “Goodnight” where all of your lights and outlets turn off, or “Watch a Movie” where certain lights dim and a lamp turns on. These pieces work together to make a smarter home.